In the previous post, I covered Irish manufacturing and services PMIs on monthly frequency basis. Here, an update on quarterly (Q2 to-date) and composite series. Manufacturing PMI rose to 55.6 Q2 (to-date) against 53.7 in Q1 2014 and 49.3 in Q2 2013. These are solid gains. Still, some lingering doubts as to just how much growth can be read off this result. Q1 2014 reading was bang-on in-line with Q4 2013 (53.6) and as we know, Q4 2013 was a quarter of falling GDP. Services PMI rose to 61.8 in Q2 2014 (to-date) against 59.9 in Q1 2014 and 54.3 in Q2 2013. Again, solid gains. Composite PMI (this is not supplied by the Markit/Investec, but is computed by myself based on their data for Manufacturing and Services) rose to 60.3 in Q2 2014 (to-date) up on Q1 2014 reading of 58.4 and Q2 2013 reading of 52.8 (note: including Construction into Composite PMI generates virtually identical result). Q1 2014 and Q4 2013 both showed strongest growth signals since Q1 2007. 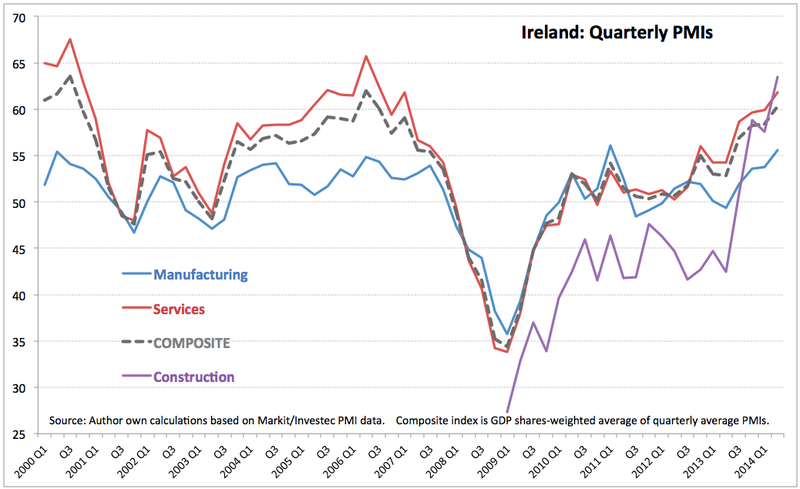 Thus, by all readings in the last three quarters, Irish economy should be expanding in Q1 2014 and this expansion should have accelerated in Q2 2014.